One Man Coffee offers brunch at pretty affordable prices. Most things on the menu were $10-12 dollars, which is relatively cheaper than the $20 onwards brunch menus we see nowadays. They share the place with Crust Gourmet Pizza, hence the shorter opening hours. We went on a weekday which might explain their extremely limited range of pastries (I think there were 4 available). 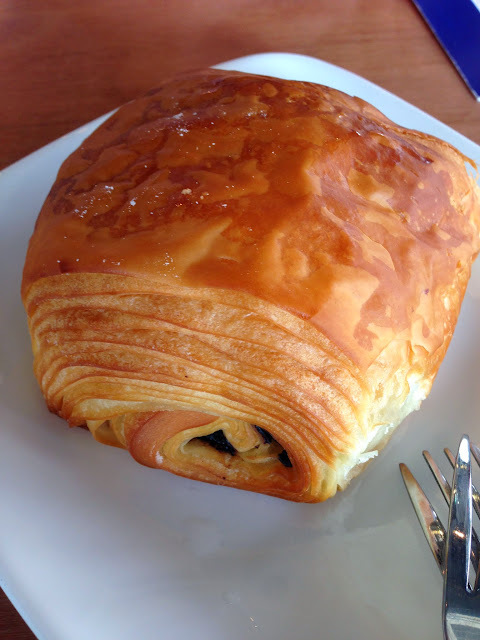 We had a chocolate croissant which did not have crisp layers despite looking like it had lots of potential. We were told it just arrived that morning (they outsource their pastries) but maybe the reheating wasn’t done properly (not sure if they used a microwave or toaster but only the latter keeps the crispiness of puff pastry). That said the chocolate core was pretty good. The friends got Magic and the art looked pretty. I wasn’t in a mood for coffee so I went for tea. They stock teabags from Allerines which is a brand that C&C uses as well. Fortunately I spotted a blend I hadn’t tried- Pear-fect Oolong- and this was super aromatic, and fruity. What I do recommend is stuff from their brunch menu. 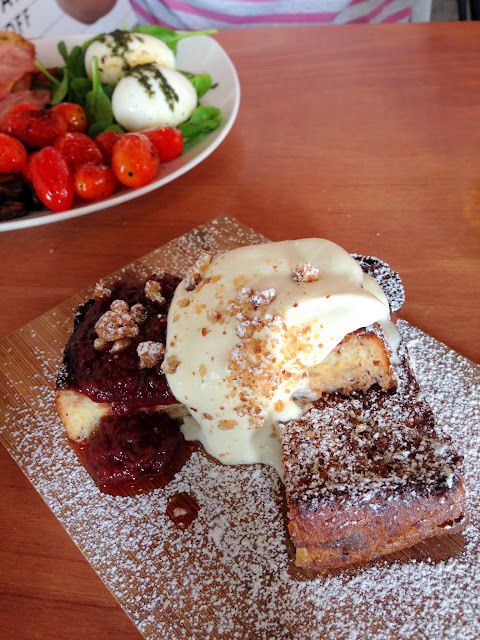 Their french toast ($10) is a small portion but at this price, I think it’s reasonable. More importantly, it’s very well made. Share it as a side dish if you really need something more substantial. The slices were beautifully caramelized, well soaked through with the egg mixture, and not too sweet. It comes with fresh cream, crushed walnuts, and a tart compote. A very good balance of flavours. The friends were quite happy with their big breakfast which is also affordably priced at $12. It comes with semi hardboiled eggs- something different from the usual poached eggs but the yolks are still runny. This is a nice place to chill on weekdays. Not pretentious at all.